The New Stain & Stamp "Shell System"
Technology prevents removal and replacement of existing stanp proprietary products. “Polymer Based Micro Topping Shell” Gives a new base to start from. Restain it in any color. The top sealant is a one part clear aliphatic uv stable urathane. An extremely durable and lasting shine that only needs resealing every 3 to 5 years. Kool Decking is the most functional, non slip, cool to the feet, surface designed to be around pools. Nothing is as functional as Kool Decking. We will restore and beautify your existing concrete driveway, sidewalk, garage, patio and pool deck surfaces. Available coatings range from Cool Deck, Epoxy’s, Urethanes, Acid Staining an a variety of stamped concrete overlays. 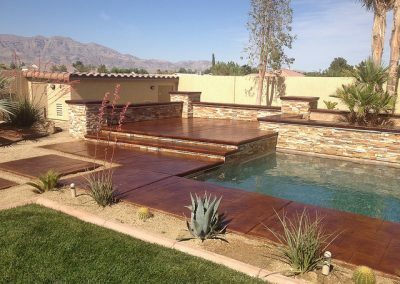 Concrete restoration can include: pool deck remodeling, cleaning, recoloring, resurfacing and concrete overlays. Overall concrete repair.